The traditional, rich, dark Christmas cake seems to be out of fashion these days. A good one, if you can find it, is very expensive, and a home-made one requires more time and planning than many people want to put into their holiday baking. If you think of it not so much as cake, but of a great selection of dried fruit and nuts flavoured with spice and brandy or rum, you might reconsider this as an essential part of the holiday fare. It is best, if you decide to make one, to make it early enough that it has time to age, preferably wrapped in a liquor soaked cloth for a few weeks. So, being a bit of a traditionalist, I decided to make one batch and share the recipe with at Fiesta Friday #43. Christmas cakes have evolved over the last decades – an evolution that I sometimes find discouraging. Artificially coloured fruits and berries and a batter that is mediocre have become the norm. I have therefore used only good quality fruit, some of it foraged from my own garden, freshly ground spices and enough brandy to make it illegal for minors to eat it. It is a cake my ancestors would recognize, and they wouldn’t even notice that it is vegan and gluten-free. The recipe can be altered to use a wheat flour and butter instead of the chestnut flour and coconut oil I used, and adding eggs wouldn’t hurt it either, but definitely not necessary. I have given the measurements for what I used, but the variety of fruits and nuts can be altered to suit your taste and what you have on hand as long as you stick to the same measurements. I wanted to use my wild apples, crabapples and pears, but any dried fruit is fine – preferably organic. There is only enough batter in this cake to hold together the fruits and nuts. I added no sugar, but with the sweetness of the other ingredients, you will not find it lacking. Not sure if this recipe would work at all, I made a few small cupcake forms just to try them out. They will improve with aging in texture and taste, but they held together fine, and the flavour was exactly what I was aiming for. Chop the fruit and nuts and place in a very large bowl or cooking pot. You will need lots of room to stir the mixture when the other ingredients are added. Cover with the 1/3 cup of flour and mix until all the fruit is coated. If there are any large chunks of fruit, break them up into smaller pieces. Mix the rest of the dry ingredients in another bowl. In a smaller bowl, mix the oil, brandy, fruit preserve and molasses. Add the dry ingredients to the fruit mixture, and when well combined mix in the wet ingredients. Stir well making sure there are no dry bits left. The batter will be very thick, but it should stick together. Line your tins with greased parchment paper and spoon batter into them. Press down with the back of a spoon and smooth the top, making sure there are no air pockets. Place a pan of water in the bottom of the oven and bake the cake(s) at 275 F.
The cooking time was 1 1/2 hours for the twelve cupcakes, and 2 hours for the 8 inch loaf and 8 inch round springform pan. If you make one large cake, you will need to bake it for about 2 1/2 hours. To check for doneness, it should be dry on top and spring back when you press on it. Remove the cakes from the pans and allow to cool. If you like, you can wrap them in a liquor soaked cheesecloth, then wrap them again in parchment paper or plastic wrap, and store them in an airtight container. When the cheesecloth dries after a few days, repeat the soaking process. You can do this regularly until they are ready to be served. When ready to serve, you can decorate it, ice it with marzipan and royal icing, or just as is. This recipe makes 5 pounds. Categories: baking, dessert | Tags: Christmas cake, dried fruits, Fiesta Friday, foraging, fruit cake, gluten free, nuts, vegan | Permalink. Winter has arrived early here in SE Ontario, and with a vengeance. I may not be able to dig up any more Jerusalem artichokes this year, but at least I got one last harvest this past weekend. I dried most of them, mostly to be ground into flour, but mixed a few with the potatoes and leeks I dug up on the same day to make a wonderful soup. I could have called my soup Jerusalem Artichoke Vichyssoise, but since I used an additional ingredient, something other than the potatoes and leeks, I did not want to offend any Vichyssoise traditionalists. Still, this soup has the same rich, velvety texture, but with a little sweetness provided by the artichokes. Then slice the lengthwise and clean between the layers carefully to remove any soil. Then, having discarded the very dry and woody bits, I reserved the dark green leaves from the trimming to make a delicious stock. The exact quantities for this soup are not terribly important. Just a mixture of the three vegetables, some water, seasoning and cream and Bob’s your uncle. This is how I made it. Peel, clean and roughly chop the vegetables. Place in a pot and cover with water or stock. Simmer gently until all the vegetables are well cooked. Blend in a blender or food processor and return to the pot. Add as much milk as you need to make it the right consistency, and salt and pepper to taste. Categories: garden vegetable, soup | Tags: gluten free, jerusalem artichoke, leeks, potatoes, soup, stock, vegan, vichyssoise | Permalink. We finally received our first snowfall of the year last night, just after I rescued every bit of green from the garden. 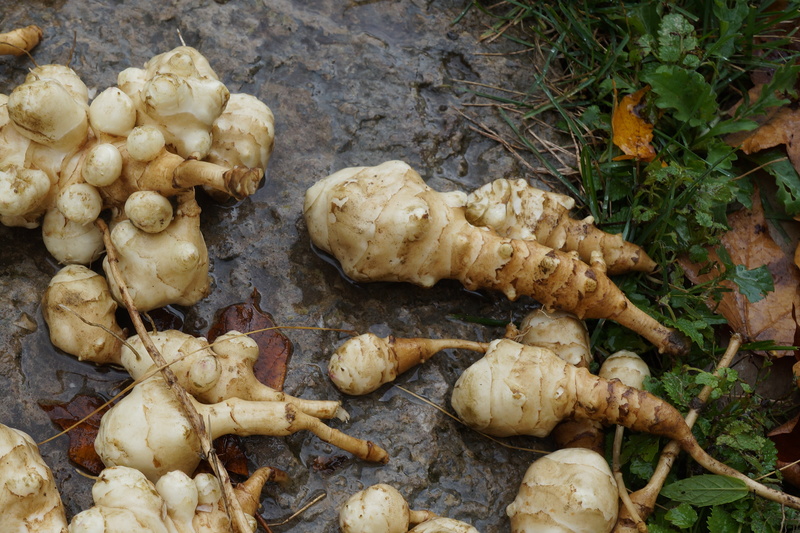 The Jerusalem artichokes should remain accessible until we get a really hard frost, but I still had some in the fridge to use up before I bring any more in. As a result, my offering to Fiesta Friday this week is a mixture of these and some of my fresh greens. I have been pleased to see that several blogs I read are making use of these tasty little tubers, but there still are not a lot of recipes out there for them. If you are hesitant to eat them, I recommend trying them in moderation and well cooked. My first ravioli recipe is made simply by mixing cooked Jerusalem artichokes with flour. I used bread flour because I wanted to make sure it was strong enough. It makes a very elastic dough, and was the easiest pasta recipe I have ever made. I didn’t even need to use my pasta machine, as the dough rolled out very easily. It is also nice and stretchy, so making the ravioli was very easy. I had no breakage at any point during the process, including during the boiling stage. It is very important to work on a well floured surface so that things don’t stick, and as long as you do that, these can be made in very little time. There are many fillings that would work with these, but I wanted to use my last harvest for the season which included arugula, Swiss chard, kale and sorrel. You will probably have a different combination of greens than I have, but there are so many you could use, alone or in combination – for example beet, turnip or carrot greens. I made my standard style pesto knowing that any extra I had could be frozen for later use and it is one of the best ways to preserve these delicate leaves. Puree the Jerusalem artichokes and salt. Add the flour gradually until it forms a clump of dough. It will be a bit sticky at this point. Wrap it in parchment and chill in the fridge for at least an hour. Divide the dough in two and roll out one half at a time on a well floured surface to the thickness of a thin pie pastry. Cut out circles and place on board or plate also covered with flour. Place a dollop of filling on a circle, then cover that with another circle. Seal with the tines of a fork all around. Drop a few at a time in boiling salted water. When they come to the surface, in about 2 minutes, they are ready. Drain and set aside. Serve as is, or top with grated cheese or your favourite pasta sauce. Categories: garden vegetable, jerusalem artichoke | Tags: Fiesta Friday, garden greens, jerusalem artichokes, pesto, ravioli, vegan | Permalink. This is a post especially for the hunters, or those who end up with the booty from their hunting buddies but have no suitable recipe. You are not going to find Canada goose in your local supermarket, but I know there are lots of people who acquire it, and once you have it, it is worth doing something really special with it. I have cooked Canada goose before, and know that it is very dark and lean, strong enough that it can stand a good amount of slow cooking and a generous amount of seasoning. I was given two birds, all cleaned and cut into nice neat pieces, so I had only two sets of legs and breasts to contend with. I wanted a dish that was easy to serve, wouldn’t have to be consumed all at one meal, and did not require any last minute fussing. If you have one bird, you can make half the recipe. In that case you could cook it in a loaf tin instead of a pie dish, but either way is good. I used two slow cookers. I’m not sure what temperature they cook at, but I had it at the low setting and the juice was bubbling gently. If you use a Dutch oven pot in your oven, I would begin with a setting of 200 degrees and check that the meat is hot enough to be cooking thoroughly. Don’t be alarmed by the addition of anchovies. When cooked with meats, the anchovies just dissolve and add a lot flavour – not fishy though. There is no salt in this recipe, but if you choose not to use the anchovies, you will need to add salt. If you don’t have angostura bitters, you could use Worcestershire sauce in its place. Fry the bacon until it is cooked and has rendered most of the fat. Remove and set aside. Fry the goose pieces in the bacon fat until browned on all sides. Put the goose, vegetables and chopped bacon pieces into a slow cooker (I had to use two cookers for this amount). Deglaze the pan in which the goose was cooked with the wine. Add the water, sage, anchovies, angostura bitters and pepper and pour this mixture over the goose. Cook for about 7-10 hours at a low setting, making sure there is always some liquid in the pot. When done, drain the liquid into a bowl, remove the meat, break it up with two forks as you would with pulled meat and discard the bones. Thicken the liquid with the flour, but no need to heat it as it will cook in the pie. Fill the pie crust with the works, brush the surface with 1 egg and make cuts in the pastry to allow steam to escape. Bake at 425 F for ten minutes, lower the heat to 350 F and cook for another 50 minutes. Serve it hot with mashed potatoes, and serve leftovers at room temperature or reheated. When cooled, the pie resembles a terrine and is excellent with pickles and salad. Categories: game, main dish | Tags: anchovies, angostura bitters, Canada goose, Fiesta Friday, goose pie, wild game | Permalink. In my last post I outlined the different ways I had of preserving a bucketful of feral pears I was lucky enough to find. Now, with a good supply of dried fruit and peel and some scrap vinegar, I was tempted to enjoy some fresh pears in an original recipe, one that suited the season and the cool weather. This fruit and nut stuffing is also ideal for those festive dinners where some choose not to eat meat, but is rich enough to appeal to vegetarians and omnivores alike. To begin with I peeled, cored and chopped the pears and then roasted them in the oven at 350 degrees for about an hour, or until they are a caramel brown and have some crisp edges. Then I chopped them some more. For the bread I used a home-made sour dough corn bread, but any firm day old bread will work. For the nuts I used pecans, and the dried mushrooms I used porcini, but these can be varied according to what you have on hand or what you prefer. Toast the nuts in a frying pan briefly until they begin to change colour. This will only take a couple of minutes, so be careful not to scorch them. Chop and set aside. Pour the boiling water over the dried mushrooms and set aside to cool. Drain the mushrooms, saving the liquid, chop them and add to the mixture. Remove from the heat. Add the nuts, pears and the onion mixture to the bred cubes and combine well. Add the mushroom water and stir again. Pour into a lightly greased casserole dish and bake in a 350 degree oven for about an hour, until it is cooked through. Categories: main dish, wild fruit | Tags: foraging, mushrooms, nuts, stuffing, Thanksgiving recipe, vegan | Permalink. At this time of year, wild fruit is the easiest to find, although you might want to hurry before the real frost hits. The trees have lost their leaves, and the apples or pears are very visible on the almost naked limbs. There are probably plenty more on the ground too! The other day, I managed to pick a bucket each of pears and apples. The apples I used for my Turkish delight – but unaccustomed to finding pears, I wanted to use them in as many ways as possible – even with this small amount. Feral fruit, i.e. from fruit trees which have been abandoned and left to grow willy nilly, are a great source for cooking. They may be small, irregular, and have a few blemishes on the skin, but I find I can always count on them to be flavourful, chemical free and just plain free. I only buy organic pears and apples from the markets since the others are notorious for their chemical content, but these can be costly and hard to find, so when available I am more than happy to forage for them. I collected a mixture of pears with light green, brown, yellow and pink skins. I have no idea what variety they had been originally, but presume they have been hybridized. Dehydrate: This method is not only a practical way to preserve and store the fruit, but results in a sweetness and flavour surpasses the raw fruit. To dehydrate pears, unlike apples, it is best to peel them, because the skin is tough and gritty. I did not soak them in an ascorbic acid infusion to prevent browning because I planned to use them baking, the colour didn’t matter and the taste is the same. If you want to preserve the colour, soak them for a few minutes in a solution of the juice of one lemon to one cup of water. I used a dehydrator because the recommended temperature is between 135 and 160 degrees F and my oven does not register that low. They are ready when they feel dry but are still a bit flexible, not brittle. Let them cool and store in bags or jars. Because I had peeled them, I had some very nice organic peels to use up. Taking my cue from a trusted fellow blogger, Urban Nettle who recently wrote about using the skins of russet apples to make a sugar-like powder, I decided to do the same with my pear skins. They need to be dehydrated until they are quite brittle. Once cooled, they can be ground to a fine powder and used as a sweetener. The taste is very sweet and the texture granular – much like sugar but with a definite pear flavour. I look forward to experimenting with this new (for me) ingredient. Scrap Vinegar: With some pears still to use, I decided to make an actual recipe, which meant more peeling and more peels, so a scrap vinegar seemed in order. The most quoted authority on this subject is Sandor Elix Katz and his book “Wild Fermentation” where the science behind this method is fully explained. It seems to be catching on, and no wonder, since it means you can turn all kinds of scraps – peels, cores, over-ripe fruit into a tasty and nutritious vinegar. To do this, I loosely filled a quart jar about half full with the peels and added two heaping tablespoons of raw honey. I then almost filled the jar with non-chlorinated water, put the lid loosely on and left to ferment in a cool place out of direct light. Stirring once a day is all the attention it needs for about a week when it gets fizzy, after which time it can be strained and left to ferment another few days, depending on how strong you want the result to be. This can be used as you would any vinegar, or mixed into a drink. Categories: preserving, wild fruit | Tags: dehydrating pear skins, dehydrating pears, feral pears, fermentation, foraging, pear scrap vinegar, wild pears | Permalink.